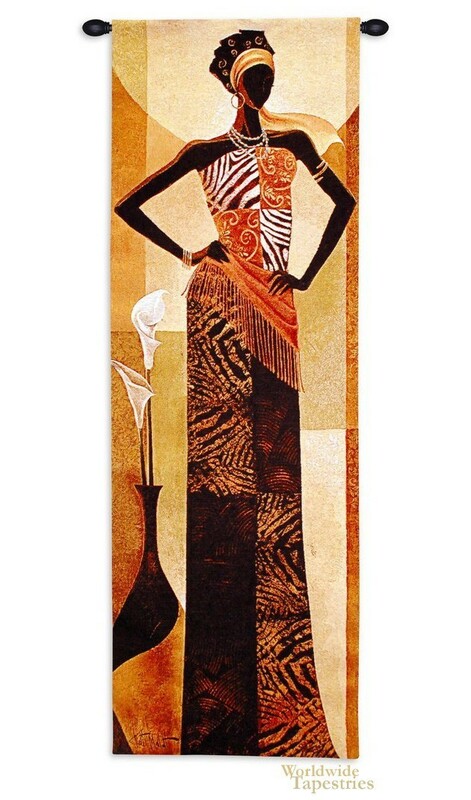 Amira tapestry shows an African woman, the work of Keith Mallett. Here we see the lady in stroking costume or patterns, and stripes, in a design which echoes the geometric background which accompanies the scene so well. The African lady is also seen in Mallett's other beautiful works celebrating the beauty of Africa. This Amira tapestry is backed with lining and tunnel for easy hanging. Note: tapestry rod, where pictured, are not included in the price. Dimensions: W 16" x H 48"